I swear, this series just keeps getting better and better. The Off Season is an incredible follow-up to Dairy Queen and if I wasn't impressed by Murdock's first novel, she's definitely made a fan out of me now. I loved this one! It was realistic, strong, and moved me beyond words. It was a much more gut-wrenching read this time around and I felt like giving D.J. a hug on so many counts. If Dairy Queen is the steady climb to a better life, of realizing the flaws in life and coming to terms with them, of living and loving and making the best of everything, The Off Season is the slow decline back into a valley of despair, with just a hint of light at the end of the tunnel. I love that Murdock's novels ring so true to real life itself and they give contemporary a whole new meaning. With The Off Season, D.J's life finally seems to be getting back on track. Not only is she seeing Brian Nelson, the incredibly cute quarterback on the rival high school team, but she herself is the star football player of her own school team. Yet, as is expected, things slowly begin to fall apart, but this time, even D.J. can't imagine just how much her very will is about to be put to the test. You see, this is what I love about this series in a nutshell: real. It is all just so very realistic, putting its characters in tough situations and making them come to terms with what's at hand and find the inner strength within themselves to deal with those issues. D.J., better than most other characters I know, is a force to be reckoned with. Of course, she doesn't see herself that way, but truly, D.J. is a solid rock. D.J. is that person who doesn't get fazed in a crisis and who you can count on not only for a shoulder to lean on, but to tell it to you like it is, without sugarcoating anything. 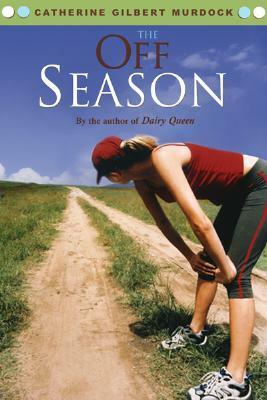 For me, the reason The Off Season was a stronger novel than Dairy Queen was all due to the characters. Dairy Queen was an introduction of sorts to the majority of our secondary characters, but with The Off Season, we see them become far more developed people on their own right, each dealing with their own problems. Perhaps best of all, to me at least, is that we finally meet D.J. 's elusive older brothers. In Dairy Queen, it was mainly the family dynamics between D.J. and her parents that was explored, along with her younger brother Curtis, who plays an interesting role in this novel too. With The Off Season, though, we see more of Bill and Win and learn to understand their side of the story and fall in love with them too. If there's one thing I've learned from The Off Season, it is merely this - that the Schwenks just never give up. Although they're all inherently such different personalities, they all share similar character traits that bond them as a family, even to strangers. It makes me wonder if all families are like this, if you just look close enough. Murdock outshines when it comes to character development, which is why this contemporary trilogy is such a strong one. Even better, though, is that she isn't afraid to put her characters through tough times and force them to make difficult decisions. A lot of the choices D.J. has to make in this novel aren't easy ones and even though some of them may have been able to be solved with simple conversation, Murdock writes everything so realistically that it is impossible not to see D.J's side of the situation. The Off Season is, to put it bluntly, a heart-breaker. Dairy Queen was a slow build-up of happiness and understanding, but The Off Season is more about finding that inner trove of strength within you to persevere on in life, no matter what life throws at you. This, dear readers, is why D.J. Schwenk is one of my new favorite literary heroines. Strength is what defines her and, in turn, what makes me admire her as much as I do. Nevertheless, despite the sad situations, difficult choices, and tense moments in this book, there is a lot of happiness and joy in the beginning. Furthermore, the continual importance of football to the Schwenk family is ever-present, making me wish I genuinely did enjoy football more than I do. I've come to regard the Schwenk's as a family much like my own; one with genuine flaws, tender moments, and family unity in times of hardship, despite their struggles with one another and overt distances. In all honesty, they've made a niche for themselves in my heart and it's hard not to look back on this series and just smile - a secret smile that tells the world that you know someone special that they don't. So, really, I can't emphasize enough that you need to meet the Schwenks, even if you're not a fan of football or a fan of much contemporary. Murdock is a brilliant writer, master character-crafter, and all-round genius with plot, which makes this series one that simply cannot be missed. May I just say: YES! Yes, yes, yes! You know I don't really read contemporary, but I loved D.J. so much. I'd probably read more of it if all authors were like C. Murdock. I think you'll like the final book even more, Keertana, and that doesn't happen often. I really hope this woman will publish something else soon. She os truly unique. On a completely unrelated note, YAAAAAAY, you're reading The Sky Is Everywhere! It's such a weird little book, definitely not for everyone, but I DO hope you'll like it. Gosh, this review makes me want to stop reading the 4 (yes, that's right, 4) books I am currently in the middle of and read this one! It's been a couple of years since I read Dairy Queen, but I am also a charter member of the D.J. Schwenk fan club! I am SO excited to hear that your think The Off Season is an even stronger book, that is STRONG praise indeed, K! Bumping this one up on the bedside TBR pile FOR SURE. I want to drop everything and read this series. I have made a note to contact the author and try and work something up for the blog soon. I know you don't give out those high ratings easily so I need to check this out. Wonderful review as always Keertana. You and Rachel have got stop compelling me to buy more books! Okay, I officially want to read this series. In fact, reading this one appeals to me more at the moment than finishing Jessica Darling. We'll see though, part of me worries it'll be too YA because I am admittedly getting old. This is a contemporary series that I am very willing to give a chance and even excited about. I know how much you and Jasprit love it and I cannot wait to get my hands on a copy. I'm glad you could enjoy a sequel more and see the characters develop. Yes, yes, yes. I totally agree with everything you've written here. It is insane how well Murdock writes about a midwestern farming family. I can't think of too many YA books (or adult books, really) that really make day-to-day farming life come alive in such a way. Listening to these books was like taking a trip there. And you're right that we got to know all the secondary characters more in this one. Truth be told, I totally teared up in my car while listening to part of this one. I stopped reading when I realized this is the second in a series, but clearly I need to check it out ASAP! Thanks for putting it on my radar. You've convinced me that I absolutely MUST pick up Dairy Queen, Keertana. I feel like I'm already missing out! The depth of this book sounds amazing- and I love how true and realistic this actually is. Also, the characterization sounds superb. I'm a big character person, and I love when we're able to actually see some development occur in a story. So, I think I'd fall in love with the characters in this book. I really loved Dairy Queen. And I have been dying to get my hands on this one. And your review has me thinking that I really need to do that soon cause I don't want to forget anything. I really love the family dynamics and I'm excited that it's just (or more) important in this book. I'm definitely getting this soon! Did you know you can create short urls with AdFly and earn money for every visit to your shortened links.